Timewell Drainage Products is expanding again, taking steps to open a plastic pipe manufacturing facility in the southern United States. They have purchased a building at 2 Industrial Parkway in Selma, Alabama for the new operation. The 40,000 square-foot building sits on 20 acres in the Craig Industrial Park. Timewell, headquartered in Timewell, Illinois, is a manufacturer of plastic drainage pipe for agriculture subsurface drainage systems and storm water removal and containment. 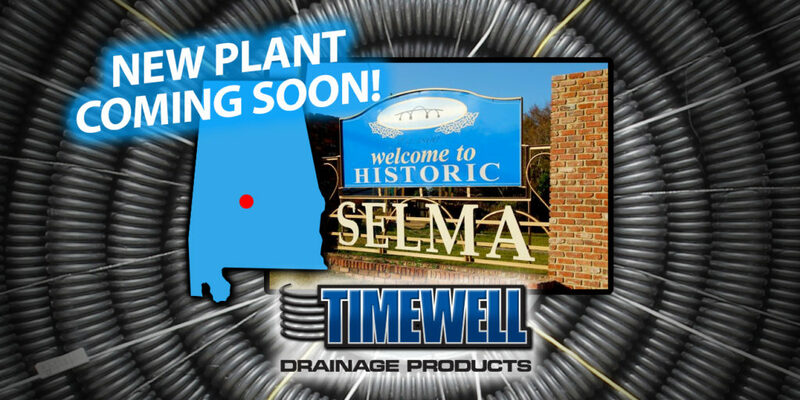 The Selma facility will become the sixth manufacturing location for Timewell. Facility renovations and equipment additions will be necessary before manufacturing begins. Timewell manufactures 3” – 15” single wall pipe and 4” – 48” MaXflo dual wall corrugated HDPE tubing products. This is the second major expansion for Timewell in less than two years. Timewell acquired Midwest Plastic Products in September 2016 including two manufacturing facilities in Jefferson, Wisconsin and Plainfield, Iowa and additional molding capabilities. The company is expecting additional growth over the next several years. Timewell worked with the Selma & Dallas County Economic Development Authority, Alabama Department of Commerce, Alabama Department of Revenue and Alabama AIDT to locate the new facility. The space has quick access to major highways and Timewell will be working with AIDT to develop a local workforce training and hiring program. For more information and expansion updates, connect with us @TimewellPipe on Facebook and Twitter.